Tangent 1…The last two sentences about snow at the end of the last blog are being repeated here; I really should just say “ditto.” … “2-4 inches as of noon weather report. I have enough snow on the ground …this is getting old and cold!” Last night 2 more inches and so it is getting really OLD and is really COLD. Enough already! For an area that was supposed to get only 13 inches of snow, we are already well above 26 inches. I heard the weatherman (same one that predicted 13 inches for the season) say this was the last significant snowfall of the season…don’t think I’ll be putting the snow shovel away too soon on his forecasting abilities. Tangent 2…Last November I won the drawing from Jane at Chilly Hollow for the Brenda Hart book Stitches for the Millennium. (http://chillyhollownp.blogspot.com/2010/11/and-winner-is.html ). I set it aside during the holidays and between Christmas and New Year I spent some quality time with, hot tea or chocolate and my new book acquisitions (https://sudukc.wordpress.com/2010/12/26/naughty-or-nice-must-have-been-really-good/ ). I really like this book and will use it often. Thank you Jane for picking my name. I made a few mental notes about canvases in my stash where certain stitches might work well… BUT I have a question about drawings and contests: Do you enter contests just to be entering a contest or does the contest have to be something you want; would like to try; or would use? If you have won a contest, do you use what you won, how? I try not to enter contest just for the sake of wining something. I hope the people who enter and win contests/drawings intend to use what they win or really love what they win if it is something already completed. 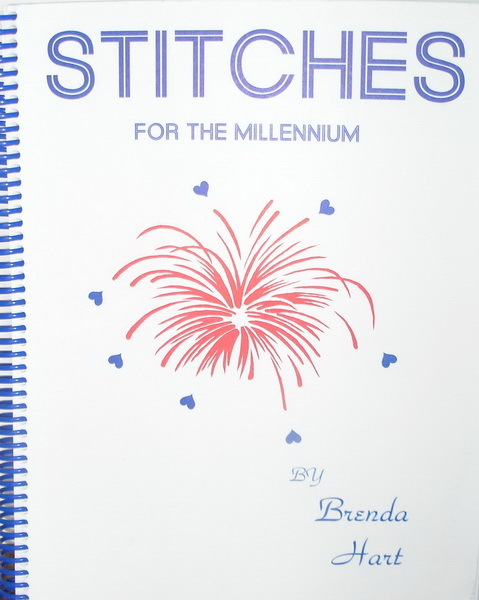 I thought I’d look in The Brenda Hart book for stitches. So with book in hand, a cup of hot chocolate and my canvas I set down and picked stitches I though could be used for the bunny: Nobuko, Mosaic variation, Slanted Brick, Scotch variations, Hungarian with tent, Scalloped Diamonds, Double Brick, Ming variation, and Slanting Rhodes. I felt like I really only needed 6 stitches at the most for the larger areas. 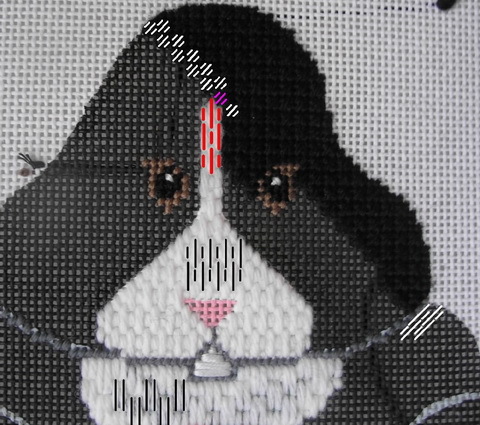 I thought the white areas needed straight stitches and the black areas slanting stitches, slanted in different directions. I am using 1 strand of Appleton wool for the white and black and my old Orchidee for the gray outlines. His eyes are tent stitches stitched with floss, his mouth a Horizontal Gobelin stitches with floss and I think I will try plaited stitches in floss for his nose but if all else fails a padded Gobelin will work too. The head did not have a good place to reverse diagonal stitches and so I decided a simple Mosaic stitch would work for both the front and back of the head. It will give the slant of the other black stitches; but is small enough that the one directional slant will not detract from the reversing slants of the other areas. I started this area on the front to make sure I liked it and to fit the Mosaic stitch (see purple stitch) around the Parisian stitch without a lot of compensation. The purple stitch was the first Mosaic stitched I placed and then stitched the remaining stitches using the diagonal method of placement. This will help minimize the distortion caused by the straight stitches. If I had stitched the Mosaic stitch in either horizontal of vertical rows there would have been even more distortion. I always try to stitch on the diagonal when possible. The bottom of his feet I would like to do in directional Slanted Bick stitches and compensate stitches for color changes, keeping compensation to a minimum if possible. His front paws, and the areas on the back bunny piece (excluding the head) will also be Nobuko. The carrot I plan to slightly pad and use Epic wool in oranges for the body. The tops are going to be Cast-on Bullions using overdyed green perle cotton. And of course his tail is going to be uncut Turkey Work, but I may do this without the tinker toy and allow random lengths. I have not given much thought to his ears yet but I’m sure something will click. I think that’s about it for now and until the thaw I will be stitching…this year appears to be making significant dents in my “round toit” canvas stash…another good thing…room for more shopping.